Why Our Nano Volcanic Mud is better than others? Nano meter is equivalent to 1 billionth of a metre(1/1,000,000,000 metre). 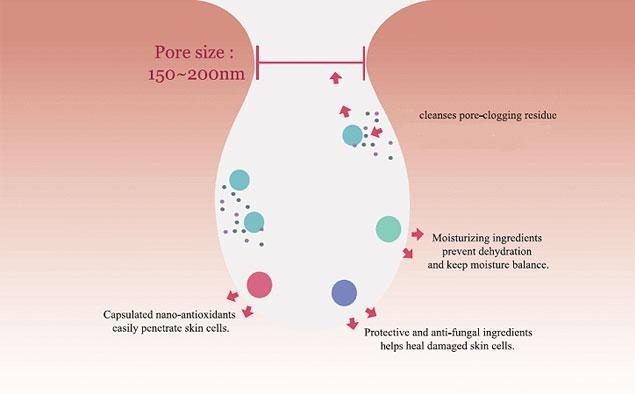 With nano technolagy, our nano volcanic mud is capable to penetrate skin's outer layer or epidermis that consists of more than 30 layers of dead skin cells with nutrients to the dermis, where these skin care ingreidents can do their best work for fast and effective absorption. The deeper these life-giving nutrients can travel into the skin, the better and faster, the dermis can then rejuvenate and repair. Antibacterial efficacy of varying concentrations of NSPs on the viability of E.coli (A), P.aeruginosa (B), S.aureus (C), and S. pyogenes (D) in saline solution. From the experiment results shown above, we know Our Nano Volcanic Mud can 100% kill bacterial in 2 hours after applying and last for 24 hours. Physical Trapping Mechanism. The antimicrobial effect of Nano Volcanic Mud(NVM) on a broad spectrum of species is attributed to their physical properties. In the presence of NVMs,platelets accumulated and associated in high concentrations on the peripheries of individual acteria, indicating the high mobility of NVMs in growth medium. As the incubation period increased, the number of bacteria decreased and cell wall surfaces appeared rough. Finally, the affected bacterial walls shrunk and degenerated. The antimicrobial activity is nonspecific for a diverse range of bacterial species owing to physical capturing mechanisms of platelets, in contrast to mechanisms involving chemical interactions. 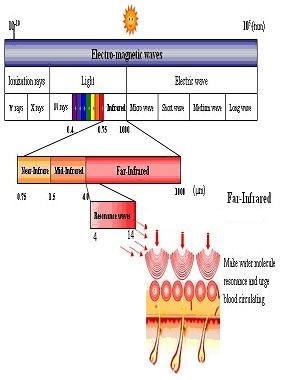 Nano Volcanic Mud is able to preforms 6~14µm Far Infrared Emission at temperature 25℃ with 3.70×10²W/m² Emission power. 1. Expands capillaries which stimulates increased blood flow, regeneration, circulation and oxygenation. 2. Promotes elimination of fats, chemicals and toxins from the blood: Poisons, carcinogenic heavy metals - toxic substances from food processing - lactic acid, free fatty acids, and subcutaneous fat associated with aging and fatigue - excess sodium associated with hypertension - and uric acid which causes pain. 3. Stimulates enzyme activity and metabolism. 4. promotes rebuilding of injured tissue by having a positive effect on the fibroblasts (connective tissue cells necessary for the repair of injury). Furthermore, it increases growth of cells, DNA syntheses, and protein synthesis all necessary during tissue repair and regeneration. Excellent for healing burns, scar tissue and skin problems. 5. Relieves nervous tension and relax autoneuro muscles thereby helping the body make the most of its intended healing abilities. FIR reduces soreness on nerve endings and muscle spasms, as muscle fibers are heated. 6. Strengthens the Immune System by stimulating increased production of white blood cells (leukocytes) by the bone marrow and killer T-cells by the thymus. 7. Strengthens the Cardiovascular System by causing heart rate and cardiac output increase, and diastolic blood pressure decrease.